When I had gone to Ulta two weeks ago, my plan was to pick up the rest of the OPI Nicki Minaj collection. A friend of mine had gone down to Philly a few weeks prior and was going to stop in a Philly Ulta on the way back, so I had asked her to pick up all 6 colors for me, if they had them, or get me basically whatever they did have. They only had Super Bass Shatter, Did It On 'Em and Fly. Ones that I wanted, yes, but not as much as I wanted Metallic 4 Life and Save Me. When I finally got a chance to go to my sorta-local Ulta to pick up the other 3, all they had available from the Nicki Minaj Collection was one lonely bottle of Did It On 'Em, which I already had, thanks to my friend. 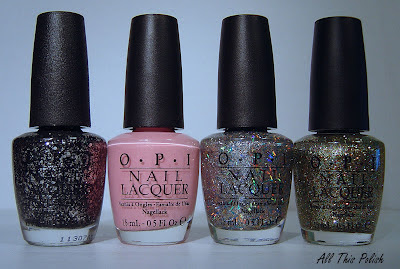 There was one website that I had stumbled across a couple months ago, mbeautylounge.com, that sells OPI polishes among other brands, but I had been hesitant to buy anything from them. On the drive home from Ulta though, I decided to take a second look at it and by Sunday I had placed my order. For some reason only after placing my order did I decide to do a search for reviews of the site and oh my God, all I found were bad reviews! At this point, I was more than a bit nervous about my order. Luckily, by Wednesday, I received an email with a tracking number and by the following Monday my polishes had arrived safe and sound. I had ordered the rest of the Nicki Minaj Collection: Metallic 4 Life, Pink Friday and Save Me, along with Glow Up Already! from OPI's 2010 Burlesque Collection. Skimming over some of the bad reviews, it seemed like a lot of the problems dealt with really large orders and international shipments. I only ordered 4 polishes and they only had to ship from Ohio to PA. So maybe that factored into why I didn't have any issues with my order, but after reading all the bad reviews, I don't think I would order from them again. It worked out for me this time, but I don't know if I'd want to take a chance on a second order. A lot of people have had legit nightmare experiences, so I consider myself lucky on this one. Even though I had no problems, I honestly would not recommend this site to anyone. After that drama was out of the way, I got a chance to stop back in at Sally Beauty to see if they had Smoke and Ashes from the China Glaze Capitol Colours Collection. I wasn't in a hurry like my last trip to Sally's, so if they didn't have it out I was going to ask for it this time. When I got there, they did have a bottle of Smoke and Ashes out and I decided to get Harvest Moon as well. So now altogether, I have half of the Capitol Colours Collection and I think that's probably all of the colors I'm interested in from this collection. Besides the two China Glaze colors, I also grabbed Orly Prelude to a Kiss and Steel Your Heart, from the Cool Romance Collection. I know I had said previously that I didn't want Steel Your Heart, but then standing there in the store, that neurotic part of my brain kicked in that says, "There's six colors in the collection and you're going to have five of them. What's one more? You might as well just get all six. Just buy it!" So I did. ::Sigh:: That's the same "logic" that I lost to when I ended up buying all of the colors from the China Glaze Let It Snow Collection, even though I'm sure I didn't need half of them. 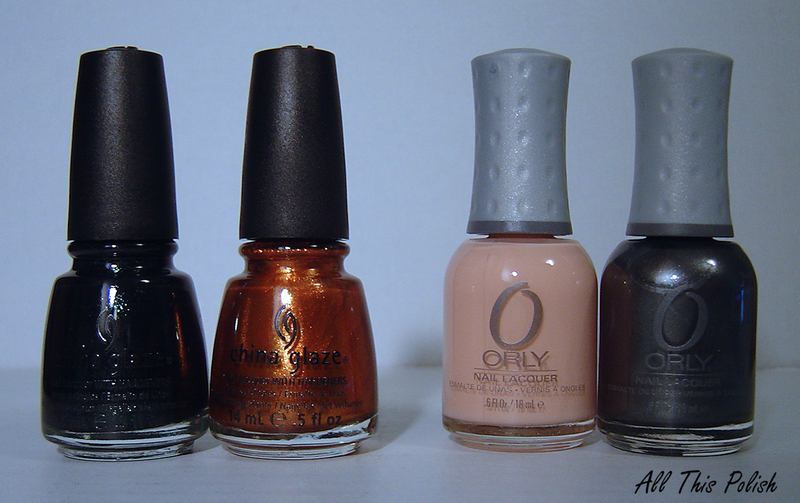 We'll see how it goes with the Capitol Colours Collection, so far I'm standing strong at six! You can expect a few more posts from me this weekend. On Friday, I received my first ever Lynnderella polishes in the mail and today my March Birchbox arrived and I'm really excited about both! I never got around to posting about last month's box but I will be taking pics of this month's Birchbox tomorrow.